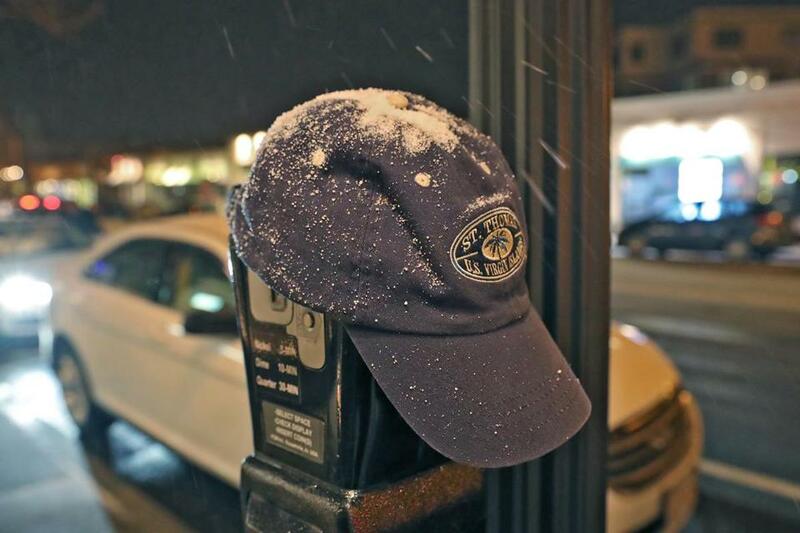 Light snow fell in Needham Center on a hat-covered parking meter. New England residents charged cellphones, stocked pantries, and canceled plans Saturday, as the region braced for winter’s first major snowstorm, an overnight into Sunday blast, which threatened to make travel treacherous and knock out power for some, even after forecasters scaled back their direst predictions. The first flakes fell midafternoon Saturday in Boston, where 3-4 inches of accumulation was expected Saturday night, but the storm’s brunt was anticipated to whack northern Massachusetts — where there was the potential for more than a foot of snow, according to the National Weather Service. The weather service issued a winter storm warning for parts of northern and central Massachusetts from 4 p.m. Saturday until 7 p.m. Sunday. The bread aisle was halfway emptied Saturday afternoon at the Trader Joe’s on Memorial Drive in Cambridge, where customers in parkas and fleece waited in long lines safeguarding carts laden with the coveted loaves — as well as milk and produce — and others studied folded paper lists. Rich Brown, a Malden resident, had none of the classic snowstorm essentials in his shopping basket — just frozen fruit for his smoothies. “This is still ridiculous,” Prescott said, gesturing at the line. Friday the store was projected to make $60,000 in sales but took in $95,000, Prescott said. “Today we’ll probably double that,” he added. Shoppers leaving the store about 3:30 p.m. Saturday were dusted with the first of the snowfall — small, nearly imperceptible flakes. With temperatures expected to rise higher than previously thought, forecasters predicted that a significant portion of the storm’s precipitation would fall as sleet, freezing rain, or ordinary rain. The weather service predicted a “significant front-end thump of snow” Saturday afternoon, though, before the transition to a wintry mix. In the Boston-to-Providence corridor, the precipitation was expected to shift to rain by dawn Sunday, with areas further inland potentially remaining below freezing. After that, forecasters said, a warmup was expected to be followed by a flash freeze that could keep untreated roads and sidewalks icy into Martin Luther King Jr. Day. Power outages and tree damage were likely because of the ice, forecasters said. Coastal flooding was also expected, along with wind gusts as high as 50 miles per hour, according to the Massachusetts Emergency Management Agency. Officials in Cambridge and Boston said Saturday that those cities were not declaring snow emergencies or parking bans, but many other communities across the region had announced one or both measures in advance of the storm. Mayor Martin J. Walsh of Boston asked city residents and business owners to shovel and salt sidewalks and to take precautions for their own safety and the safety of others. “We are encouraging residents to use caution when traveling, assist older neighbors and those who are disabled, and keep up with the shoveling of their property throughout the storm this weekend,” Walsh said in a statement. Boston’s Public Works Department pretreated streets with salt and had 42,000 tons of salt and 600 pieces of snow-removal equipment at the ready to address the storm, Walsh’s office said. Snow emergencies were declared in communities including Chelsea, Dedham, Haverhill, Lowell, Northhampton, Revere, Waltham, Watertown, Salem, and Somerville. Andover, Framingham, Seekonk, Woburn, and Worcester were among the communities that announced parking bans. The Massachusetts Department of Transportation cautioned drivers to stay off the roads if possible and to exercise caution if they must travel. In Revere late Saturday, the driver of a car heading south on North Shore Road lost control of the vehicle and drove into a body of water, according to a police spokeswoman. The driver was able to get out of the car and is expected to be okay, she said. “If you don’t need to go anywhere, we really advise that you stay at home,” MassDOT Highway Administrator Jonathan Gulliver said at a news conference. He asked those who must travel “to really keep a close eye on the forecast” because of the changing conditions. MassDOT planned to have about 3,900 pieces of equipment on roads across the state at the height of the storm, Gulliver said. The MBTA announced that, because of the storm, planned shuttle bus replacements on the D branch of the Green Line and on the Red Line’s Braintree branch are canceled for the weekend. Keolis Commuter Services, the operator of the MBTA’s commuter rail system, said it was dispatching 350 workers to respond to the storm and its aftermath. Amtrak is operating a “modified service” Saturday and Sunday because of weather conditions. On Charles Street in Beacon Hill, a dusting of snow had accumulated in the cracks between the bricks Saturday afternoon, as a handful of shoppers walked the nearly empty streets. A display of plastic toboggans leaned against the window of Charles Street Supply, a neighborhood hardware store. Throughout the day customers prepping for the storm were mostly purchasing salt, batteries, and firewood. “After the snow is when they buy the sleds,” Lyons said. Globe correspondent Lucas Phillips and Abbi Matheson of the Globe staff contributed to this report. Jeremy C. Fox can be reached at jeremy.fox@globe.com. Maddie Kilgannon can be reached at maddie.kilgannon@globe.com.